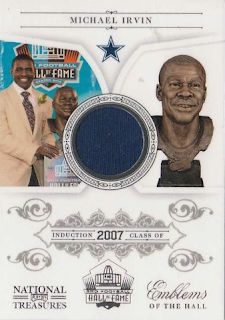 All About Sports Cards: Michael Irvin Gives Captivating Interview To The Knight's Lance. Michael Irvin Gives Captivating Interview To The Knight's Lance. Say what you will about Michael Irvin and you will probably be right. Controversy follows him but there is no denying what he did on the gridiron. Five pro bowls, three Super Bowl wins and a member of the Pro Football Hall of Fame. He recently sat down to sign for Panini and took a few minutes out of his time to give an interview. From a portion of what he said, you'll understand why he was happy to talk. The video is captivating, definitely worth viewing. I would post it here but don't feel it's fair. You should head over to The Knight's Lance to watch it. Use this link to get there.